Hanau, Germany, was a center for silversmiths from the mid-19th century to the first decades of the 20th century, and whose major works involved copying or recreating antique styles in flatware and holloware. Its special status allowed it to be free of the marking system that was incumbent on all other German cities, and many are not completely known today. 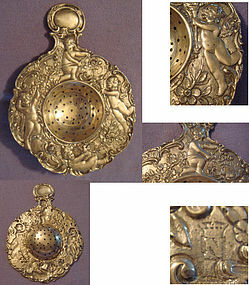 This tea strainer is typical of Hanau work – Renaissance elements, such as putti with bows and arrows, torches, birds frolic in an idyllic garden of flowers contained by scrolls. There is only one mark, a block N beneath a crown (Neresheimer & Sons? ), hidden in the garden. There is no purity mark, but it is doubtless 800 fine. There is no monogram, and the condition is excellent. The (irregular) diameter is just under 4 in. – 5-3/16 in. to the end of the handle, and its weight is 70 g.